Marijuana is the most commonly used illicit drug by college students. 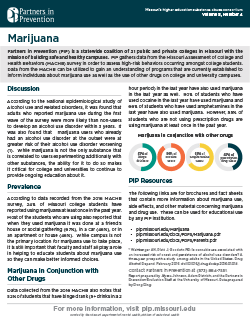 An analysis of national survey data indicates that students attending college are at a significantly higher risk of beginning to use marijuana than those not enrolled in college, underscoring the need for improved prevention efforts. 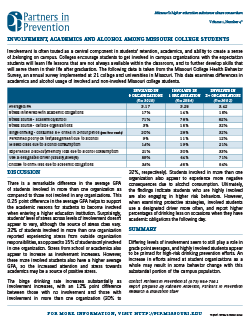 Studies have also established an association between marijuana use and poor academic performance in college. There are also negative short and long-term health effects of using marijuana, and long-term use can lead to addiction and/or dependence. The rate of current use of illicit drugs among young adults aged 18 to 25 in 2013 (21.5%) was similar to the rates in 2009 to 2012 (ranging from 21.3% to 21.6%), which was consistent with the steady rate of current marijuana use in this age group during this time (19.1% in 2013 and ranging from 18.2% to 19.0% in 2009 to 2012). Daily marijuana use among college-aged young adults has been climbing in recent years. In fact, 11.8% of non-college youth (those 1 to 4 years beyond high school) were daily users in 2015—the highest since 1980. Marijuana use had the largest number of persons with dependence or abuse among illicit drugs in 2013 with 4.2 million individuals – approximately 9% of users overall become addicted to marijuana. 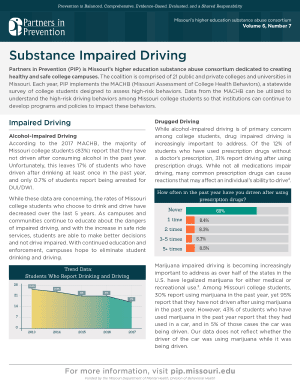 It is never safe to use marijuana and drive a vehicle, and of students who had used marijuana at least once in the past year, 5.1% report driving after using marijuana. 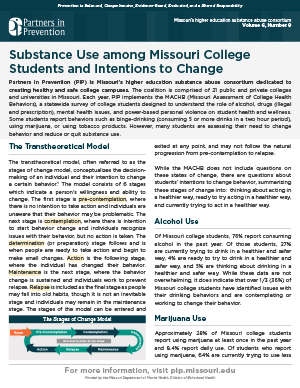 MACHB data indicates that 34% of Missouri college students that use marijuana are thinking about quitting less or using, ready to use less or quit, or are currently trying to use less or quit. 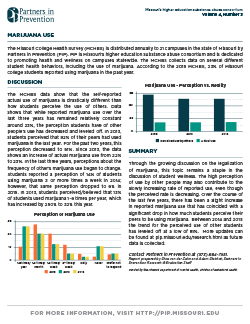 Annual marijuana use is higher among college males than females (39% versus 32%). Click on a brief below for more information. CASICS (Cannabis Screening and Brief Intervention for College Students) is a nationally recognized marijuana education and prevention program for college students. Following a harm reduction approach, CASICS aims to reduce risky behaviors and harmful consequences of marijuana abuse. The program is designed to assist students to examine his/her own behavior in a judgment-free environment. Motivational Enhancement Therapy (MET) is a counseling approach that helps individuals resolve their ambivalence about engaging in treatment and stopping their drug use. This approach aims to evoke rapid and internally motivated change, rather than guide the patient stepwise through the recovery process. This therapy consists of an initial assessment battery session, followed by two to four individual treatment sessions with a therapist. In the first treatment session, the therapist provides feedback to the initial assessment, stimulating discussion about personal substance use and eliciting self-motivational statements. Motivational interviewing principles are used to strengthen motivation and build a plan for change. Coping strategies for high-risk situations are suggested and discussed with the patient. In subsequent sessions, the therapist monitors change, reviews cessation strategies being used, and continues to encourage commitment to change or sustained abstinence. Patients sometimes are encouraged to bring a significant other to sessions. Research on MET suggests that its effects depend on the type of drug used by participants and on the goal of the intervention. This approach has been used successfully with people addicted to alcohol to both improve their engagement in treatment and reduce their problem drinking. MET has also been used successfully with marijuana-dependent adults when combined with cognitive-behavioral therapy, constituting a more comprehensive treatment approach. Cognitive-Behavioral Therapy (CBT) was developed as a method to prevent relapse when treating problem drinking, and can be adapted for marijuana use. Cognitive-behavioral strategies are based on the theory that in the development of maladaptive behavioral patterns like substance abuse, learning processes play a critical role. Individuals in CBT learn to identify and correct problematic behaviors by applying a range of different skills that can be used to stop drug abuse and to address a range of other problems that often co-occur with it. A central element of CBT is anticipating likely problems and enhancing patients’ self-control by helping them develop effective coping strategies. Specific techniques include exploring the positive and negative consequences of continued drug use, self-monitoring to recognize cravings early and identify situations that might put one at risk for use, and developing strategies for coping with cravings and avoiding those high-risk situations. The County of San Diego has a great literature review on best practices for marijuana from their department of Health and Human Services. SAMHSA also has a good guide from 2014 on strategies and interventions to prevent youth marijuana use and covers interventions on an individual level, a relationship level, a community level, and a society level. The Minnesota Department of Health and Human Services has an extensive bibliography from 2015 of best practices for marijuana use prevention. While state laws across the country are changing, marijuana is still an illegal substance in the state of Missouri. 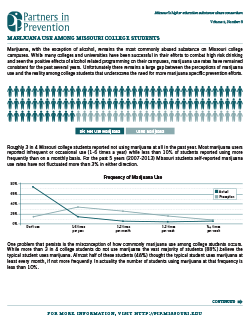 While some counties or cities have chosen to decriminalize marijuana for small amounts, all Missouri colleges and universities are covered under the federal Safe and Drug-Free Schools and Communities Act that prevents the use of illegal drugs on campus. Individual campuses also have their own policies and procedures for handling possession of illegal drugs, paraphernalia, and other drug violations. Check with your campus law enforcement and/or conduct office for information on specific policies on your campus. © Curators of the University of Missouri. All rights reserved. DMCA and other copyright information. An equal opportunity/access/affirmative action/pro-disabled and veteran employer.